"I wonder where he came from?" 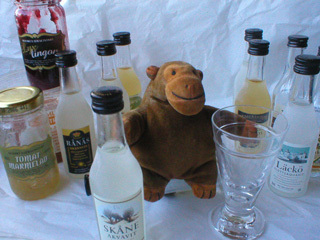 When he got home, Mr Monkey examined the things his humans had brought back from Sweden. They'd bought a small selection of preserves - cloudberry and lingonberry jams and a tasty tomato marmalade - and a larger selection of different sorts of aquavit. 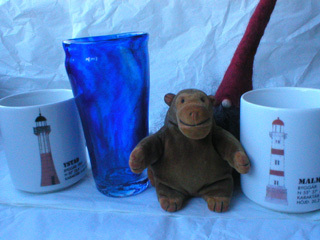 And there were a pair of mugs showing the lighthouses of Ystad and Malmö, and the glass made by Mr Rik at Steninge, which turned out to be a little wonky. There was also a strange small person, who seemed to be mostly nose and long hair. Mr Monkey wasn't sure where he'd come from, until he translated the name of Ms Katarina's street. When he realised that Tomtebogatan meant Elf's Nest Street, it became obvious that an elf had crept into the luggage before they left Ms Katarina's.